Have you been stalking me in my lounge room? Come play with me! Have you been stalking me in my lounge room?? 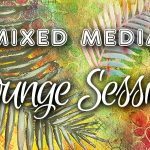 My Lounge Sessions are now in full swing and I have already shared 10 of them with you! Lounge Sessions are sneak peek videos of what I do in my secondary studio (in my lounge!). Love and Sunshine to you my Creative Friend! !